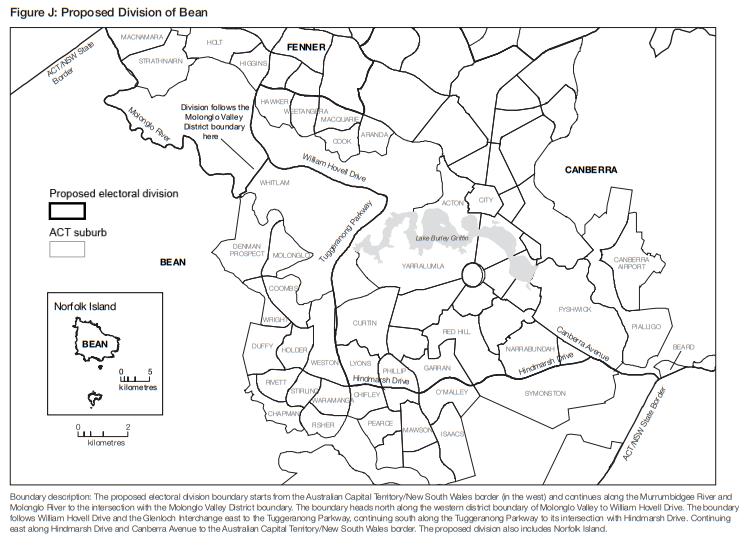 The Liberal Party will be talking up its chances of winning the proposed third federal seat of Bean after the Australian Electoral Commission unveiled its redistribution in the ACT, dividing the Territory into northern, central and southern seats. Bean, named after the World War 1 correspondent and author Charles Bean, is based in Canberra’s south, which has grown into somewhat of a Liberal stronghold in recent years. But the Labor Party, which has been dismissive of the Liberals’ aspirations, will still be favoured to win the seat at the next Federal election due next year and deliver, with Eden-Monaro, a solid four-seat bloc to Opposition Leader Bill Shorten. Labor will be keen to avoid a parachuted-in, big-name candidate and pre-selection brawl for the new seat, and will choose a strong local representative. If the High Court knocks the immensely popular Senator Katy Gallagher out of the Senate because of her one-time dual citizenship, the possibility exists of her returning to federal politics in the Lower House. Although current member for Canberra Gai Brodtmann has said that she has an affiliation with the people of Tuggeranong and would contest the southern-most seat. The ACT Greens were quick out of the blocks to stake their claims on Canberra, held by Ms Brodtmann, which will become a central inner-city seat they say is now one of the greenest in the country. “This new seat will be a contest between Labor and the Greens and we will be in it to win it, because Canberra and the Greens are on the same page,” ACT Greens Co-Convenor Emma Davidson said. 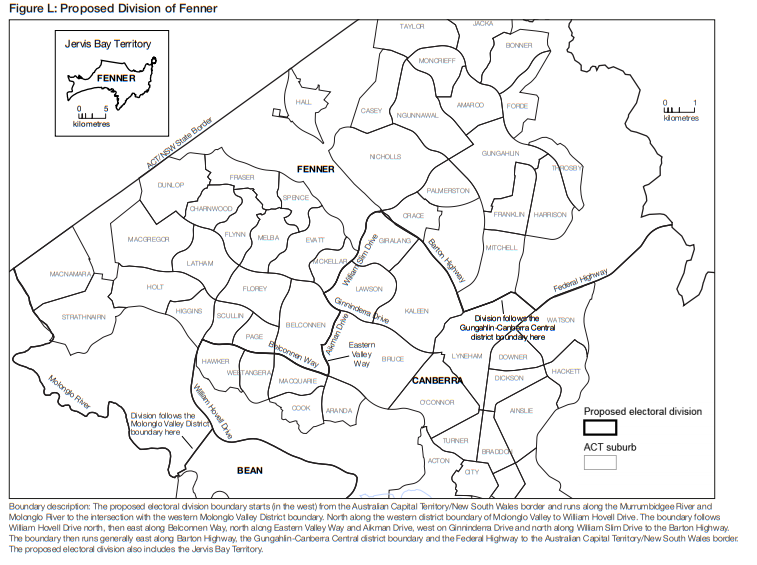 Under the AEC proposal, Fenner and Canberra will be retained as seat names, with Fenner, now held by Andrew Leigh, to cover Gungahlin, Hall, most of Belconnen and Jervis Bay. Canberra will include the city and other areas immediately adjacent to Lake Burley Griffin, as well as inner Belconnen suburbs through to Giralang in the north and Hawker in the north-west. 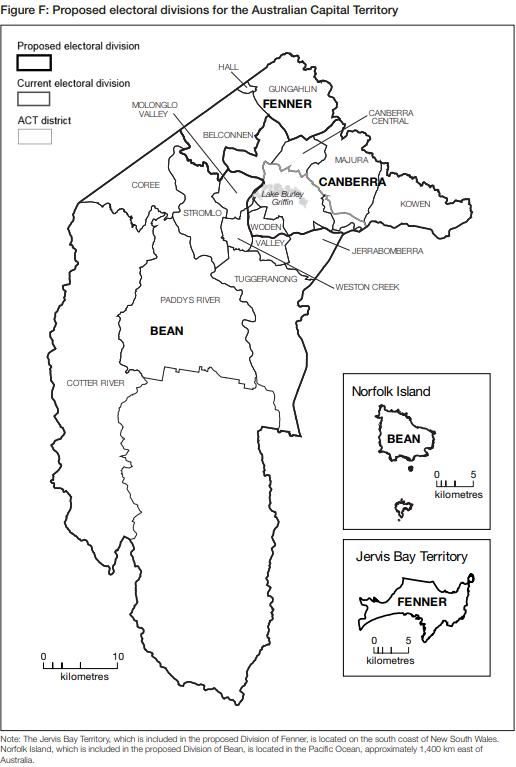 Bean will cover the southern part of Canberra including Tuggeranong, Molonglo Valley, Weston Creek, part of Woden Valley and Norfolk Island. The ACT’s growing population prompted the redistribution, with 288,346 electors enrolled in the Territory in September last year when the distribution commenced. Fenner and Canberra are the two largest seats in the country by population. The AEC said that with the number of voters projected to be enrolled in 2022 is 299,097, and the projected enrolment quota at 99,699 electors, the Redistribution Committee was required to construct electoral divisions which were projected to contain between 96,210 and 103,188 electors by 13 January 2022. The Chair of the Committee and Electoral Commissioner, Tom Rogers, said the Committee was faced with a situation where the northern part of the ACT was experiencing higher population growth than the south. 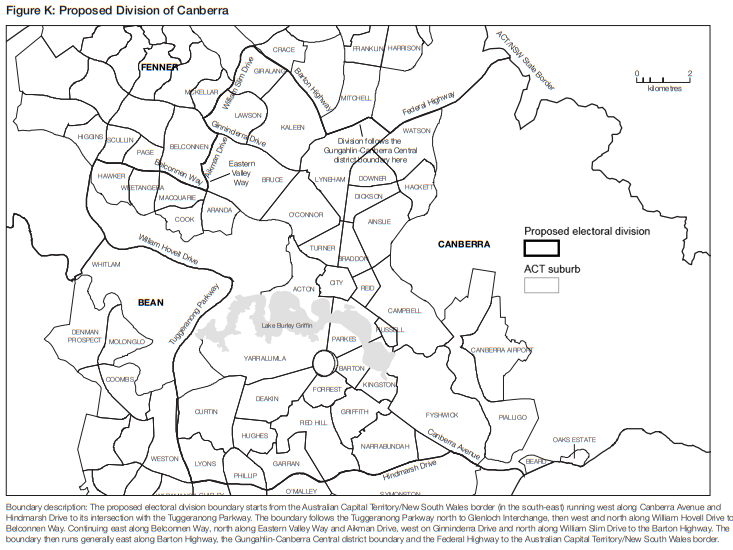 “With the increase to three federal electoral divisions, the northern localities of Gungahlin and Belconnen can no longer be fully contained in a single federal electoral division,” he said. The AEC said that overall, 150,003 voters enrolled in the Australian Capital Territory (or 52.02 per cent), would be changed to a new federal electoral division as a result of the proposed redistribution. Bean was one of three names short-listed by the Redistribution Committee. The others were Cullen, named after Ngingali Cullen who was an Aboriginal activist recognised for her work on National Sorry Day, Stolen Generation memorials in Reconciliation Place and the Journey of Healing; and Nott, after Dr Lewis Windermere Nott who strongly advocated over many years for the representation of the Australian Capital Territory in the House of Representatives and became the first Member for the Australian Capital Territory. The decision is subject to objections which must be lodged no later than 6 pm (AEST) Friday 4 May 2018. Comments on the objections will then be accepted until 6 pm (AEST) Friday 18 May 2018. All comments on objections received by the deadline will also be made available for public inspection from Monday 21 May 2018.